Subject description: Having fun with analog noise! I just finished creating a John Simonton "Wind" using the manual found at PAIATalk. The circuit is so simple, it's best built on perfboard. It's a nice short weekend project. Really cheap too! No chips, just transistors and diodes for semiconductors. I've mounted it in my homebrew FracRac cabinet with it's sister (brother?) product, the PAIA Surf Synthesizer. This was my very first Synth DIY project built the summer of 1977. This is about my 3rd restoration of it. The surf synth has the mods suggested in a reader letter from 1972 with the exception of not reversing the filter diode D1. That just leaves the silly thing wide open with no control. Both units use panel mounted pots instead of trim pots and have a volume pot for mixing. the audio sample I recorded uses both units set to the extreme.....so it's like a wind storm at the beach. You can obviously dial everything back so it could be a pleasant day at the beach, but that's just not as fun! Very minimal knob twiddling. I prefer the analog wind and surf over my more 'realistic' sample-based GM/XG units even though those probably sound more realistic. nice! can you share the schem? Nice work, as usual. It's great to see the Oldies but Goodies recreated -- then think about ways to update them! It appears the Wind synth knobs are also "oldies." Thanks Pinky for the schematic link. Yeah, Richard. I'm sure they're at least 20 years old....probably 30. 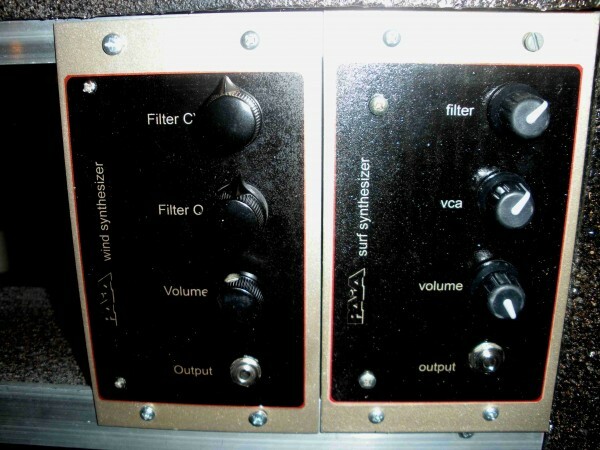 I wanted to use the same knobs as I had on the Surf unit, but the price for a 100 ohm d-shaft, (for the filter Q), were unreasonable for this project. I was curious to see the schematic. It was easy to find on PAIAtalk. I can see that Q7 is the noise source, buffered by Q8, into a twin-T filter built around Q9, but I don't quite understand the prupose of D1 and why there are 3 multivibrators also feeding in to the filter at D1. Do you have a sample without the surf module playing so I can hear what it does on its own? D1 acts like a voltage controlled resistor. John Simonton used this technique a number of times. The 3 multivibrators create a pseudo random CV to the filter. The output wave are ramped squares /---\ but their periods are of varying length so you get different intensities instead of a steady triangle wave modulation which sounds very artificial. I'll run a surf sample when I get a chance. I was planning on running one channel with surf and one channel with wind so you could separate the two, but I must've forgot to pan the inputs of my mixer before recording. Here's a softer surf-only sample. I would call this "medium" intensity. I may have touched the filter knob once or twice, but this is mostly as-is. someone pass me a margarita? Check out the Band Pass Filter and the Low Pass Filter. I believe Thomas Henry mentioned the Low Pass Filter thumps with fast envelope times. Well, there's always a trade off with simple circuits. In the SurfSynth the operation is turned around in a way I don't fully understand, and in any case, since the CV is constantly changing, which way is up and which is down is irrelevant. Actually it's the same. John Simonton was PAIA. He would typically release a product to Popular Electronics or Radio-Electronics here in North America, then sell the kit to readers of those magazines as well as his own catalog. The mods at the very end of that article I did implement with the exception of reversing the diode. I still like to maintain filter control. John did do a redesign in the August 1992 issue of Electronics Now called the Surfman which replaces the two-transistor VCO design with 74HC14-based oscillators. I haven't built that one, so I can't really compare the two. Nice one. I always wondered what this sounds like. Running on 9 V with a 40106 IC and into 63 ohm headphones, this circuit sounds really nice, quite like Dan Lavin's sample. However, I need to connect a real speaker, so I put a 100 ohm resistor to ground on the output of the Surfman schematic, then a 2 kohm series resistor into a 50 kohm trimmer as a volume control for an LM386-based amplifier (schematic from the datasheet, gain of 20, no input cap) into an 8 ohm speaker. There is sound, but only on a narrow window of the trimmer setting. The highest volume I'm getting is okayish, but not great. Most of the range results in (almost) no sound or high-pitched regular farting sounds. Raising the LM386's gain to 200 does not help at all, neither does bridging the 120 ohm output resistor from the Surfman schematic. My rather limited abilities in circuit analysis make me figure that this is probably an impedance matching problem. I arrived at the values I mentioned by putting together pieces of information gathered at various online places and from trial and error; however, preferably I would like to understand how to calculate component values. Any pointers where to learn about impedance matching for beginners? My search engine skills are obviously not up to it, and consulting The Art of Electronics did not make me any smarter. What's the voltage output of the basic circuit without the 100 ohm going to ground? That's important to determine how much gain you can get out of this. So that output stage is an op amp. Very commonly, for the circuits I've worked on around here, the output resistor is 1K rather than 120 ohms, so you might try simply swapping that out for a 1K and see if you get better results. Putting a 100 ohm to ground with the 120 ohm circuit cuts your output level by half. That certainly could cause output level problems. Don't use it with the 1K or you'll cut your signal by 90% (roughly). You might also try simply omitting that 100 ohm resistor and seeing if you get better results. The output stage looks like it already has a volume control, is there a reason why you wanted to add one to the LM386 stage? You could use it as a simple fixed-gain amplifier and still control the volume from the original circuit. I would try using the 1K, no resistor to ground, straight into the LM386 circuit from the datasheet listed as gain == 20, except I'd run the 1k directly into pin 3 rather than through the additional volume control. if that didn't work, I'd go back to using the 10k volume control as well. The gain is fixed at 20, so that volume output I mentioned before is important. If the level is higher than 400mV you will likely get clipping (with a 9V supply) at which point we'd have to go back to the drawing board.... And if the level is below 50mV you'll likely need to use a higher gain setting for the amp with a resistor and a cap between pins 1 & 8. Thank you, elmegil! This already helps a lot. I'm going to measure this, have to power up the oscilloscope. That didn't change anything. In fact, 120, 1 k, or 2 kohms do not change the level of the signal in an audible way. Did that. For some reason I need the trimmer. Set correctly, everything is kind of fine. Next to the good setting is farty motorboating, farther away the signal is lost. Anyway, the problem is a lot smaller - yet I'll try to understand this trimmer issue. Is there any way that modern general purpose transistors can be substituted for those specified? Or, are the specified transistors still readily available through normal sources? Dan, actually yes. Although my Surf Synth restoration was the original trannys, I just used 2N3904's and 2N3906's for the Wind Synth. Should be able to do the same with the Surf Synth. per my post above to Danno, the PAIA units are not exclusive to "legacy transistors." When JS created the things, those were really commons PNP and NPN's. General purpose NPN and PNP's will work just fine. No magic involved. I had not seen that link donpachi. Thanks. I played around with this circuit on breadboard for a while (the original one). I too wanted to eliminate the transistor oscillators so I used a 40106. The thing is, the 40106 did not achieve the same results as the transistors did. You don't need a scope to see this. I attached a LED to each transistor circuit and watched the pulses of light. With the three transistor oscillators, they are not 50% duty cycle. I needed to change the pulse width to get the same result as the original. Without doing this, the waves did not crash as 'naturally as the transistor version. I'd be interested to hear a sample of what you have. EDIT! Oh, I just see the resistors on the inverters. I suspect that would work. I used diodes. Thanks So I'll build it too since I am interested if the circuits really sound the same. A recording I just did has more pronounced deep rumbling and howling compared to Dan's, this might be attributed to the mic's position, which was close to the membrane. On the other hand, a larger speaker (6" compared to 3") sounds even more bassy. The crashes can be heard in any case. I fiddled a bit with the frequency knob throughout. Sound sample of the Surfman recorded through an LM386 amp, 3" speaker, and SM 58 clone. Just thought "what the heck" and connected the Surfman to a preamp input of my soundcard with alligator clips. The frequency response should be a lot better this way. Surfman straight into MOTU 828 (original schematic, signal was taken after 120 ohm output resistor).